Yesterday was the last day of school and let me just say, it's been a looooong year. Not that my kids have trouble in school or anything but Tom was in first grade this year as opposed to Kindergarten and it was something else altogether to have both him and Annabelle doing homework and needing my help with something all the time and also Olivia who felt a little left out at not having any homework (I'll let you know how she feels when she does have some homework in a few years...) and me just trying to keep everything up so that all hell will not break loose. Time for blogging? Not so much. So, yesterday was the traditional Breakfast at School day and all the parents were invited to bring a little something and have breakfast with the kids and teachers. I decided to make Snickerdoodle Cookies, because you know, when do you get to eat cookies for breakfast other than the last day of school? The night before as I was making them (at about 9pm) Martin commented that they smelled like Cinnamon Rolls. And that's when I had a flash: frosting!!! So the next morning I whipped up a small batch of frosting, made a cute little swirl on each cookie and voilà! 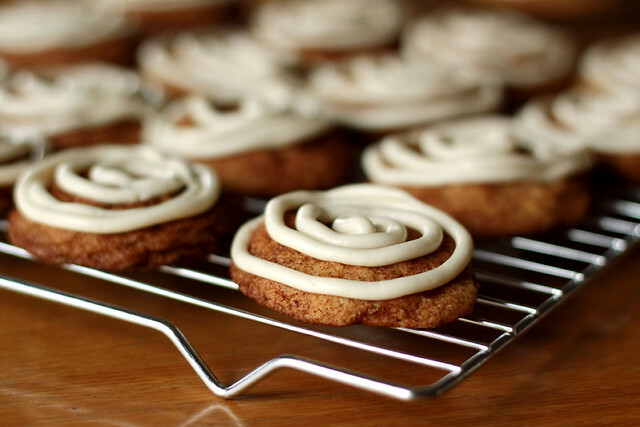 Cinnamon Roll Cookies! They were a huge hit, the breakfast was once again a success and finally, summer's here (albeit a little cool still, though I'm not complaining) and hopefully we can relax, relax and, uh, relax some more. Preheat your oven to 375F and line a baking sheet with parchment paper. In a large bowl with your mixer of choice, beat butter and 1 1/2 cups of granulated sugar until light and fluffy. Add the eggs, one at a time, beating well after each one and then add the vanilla and corn syrup. Mix well. In a separate bowl, whisk together flour, baking powder, baking soda and salt. Add to the wet ingredients and mix until smooth. In a small bowl, whisk remaining 1/4 cup of sugar with the cinnamon. With a tablespoon or a small ice cream scoop, form the dough into balls (about 1 to 1 1/2 inch in size) and roll the balls in the cinnamon sugar to coat. Place them on the parchment lined baking sheet, leaving about 2 inches between each cookie, and bake for 10 to 12 minutes. Cool the cookies completely on a wire rack before icing them. In a stand mixer using the whisk attachment, beat the butter and cream cheese together until smooth. Add the sifted confectioner's sugar slowly, then the vanilla extract and beat well. If needed, add a little warm water until desired consistency. Using a pastry bag with a small round tip, or a ziptop bag with one of the corners cut, make swirls on the cooled cookies. The icing does not completely set so if you want to make them ahead of time and serve them later, I suggest you ice them just before serving. Makes about 42 1 1/2 to 2 inch cookies. 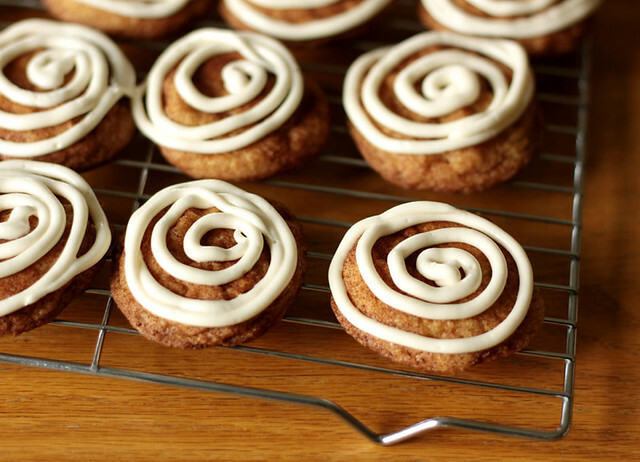 What a cute idea to make these into cinnamon roll cookies! I love the frosting idea and they look delicious! They look so good! :D Delicious! Those cokies look fantastic! I love the combination! My mom made snickerdoodles every year for the neighborhood Christmas cookie exchange, and I remember how special I thought they were. But I think what you've done with them makes them even more special! I have this on my must-try list. I love when I'm struck by a moment of genius like that. Great idea, and I bet the kids had a blast. I'm sure they were a hit and your kids must have been so proud :) Happy summer to you! these are so adorable - what a creative idea! The icing on the top is a great idea and Snickerdoodles are a favorite at our house. The icing on top of the snickerdoodle = brilliant! I may have to try that out. Such a cute spin on the "cinnamon roll."